Alive to history in the making (and the weight of the past) this volume examines Obama's presidency and Lyndon Johnson's, the killing of Trayvon Martin and the death of Andrew Breitbart, Occupy Wall Street and "America Beyond Capitalism." It presents essays, poems, and plays that speak to our times and challenge the liberal imagination. 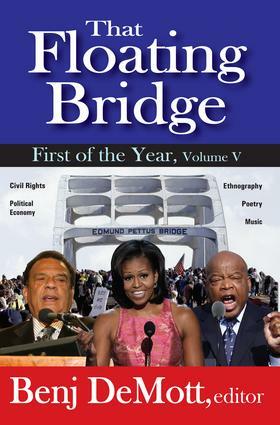 The title, That Floating Bridge, evokes Representative John Lewis' line�"Obama is what comes at the end of that bridge in Selma"�as it quotes a track on Gregg Allman's Low Country Blues, which Scott Spencer lauds here in a review for the Ages.That Floating Bridge's peerless range of contributors includes Amiri Baraka, Gar Alperovitz, Bernard Avishai, Uri Avnery, Bill Ayers, Paul Berman, John Chernoff, Mark Dudzic, Carmelita Estrellita, Henry Farrell, Fr. Rick Frechette, Donna Gaines, David Golding, Eugene Goodheart, Lawrence Goodwyn, Lisa Guenther, Alec Harrington, Malcolm Harris, Casey Hayden, Christopher Hayes, Patterson Hood, Roxane Johnson, Ben Kessler, Bob Levin, Philip Levine, Bongani Madondo, Greil Marcus, Scott McLemee, Judy Oppenheimer, Jedediah Purdy, Nick Salvatore, Aram Saroyan, Tom Smucker, Fredric Smoler, Violet Socks, A. B. Spellman, Scott Spencer, Richard Torres, Jesmyn Ward, and Pablo Yglesias.An account of how Franz Boas "did more to combat race prejudice than any other person" anchorsone section, but the volume also addresses devolutions of "diversity" linked with careerism in the art world and academe. An un-scholastic section titled "Criticism of Life"celebrates older and younger critics/poets. Songs are key to this volume's good times. Music writing�ranging from Eddie Hinton's Very Extremely Dangerous to Berlioz's Romeo and Juliet�enhances the pleasures of this text.